The “ask DS team” posted a blog post about “Two lines that can save your AD from a crisis”. 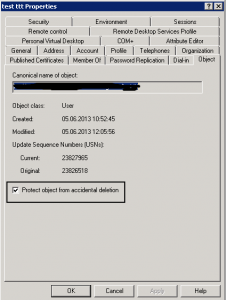 Not a bad thing to do as it will prevent you or another admin to accidentally delete users or computer objects. The lines they wrote protected users, computers and OUs. Did they forget about Groups? # computers and groups in your domain where the attribute is set to "false"
What if you’d like to move the user object to a different OU? Same error as above. You must set the attribute to ‘false’. Will Gareth Bale stay with Spurs next season? When you take a System state backup of a DC it includes a backup of your SYSVOL with all your GPO’s. If a GPO get corrupted or is accidentally deleted you have to restore the System state to get the policy back. This operation is time consuming. With the Group Policy Management Consol (GPMC) you can take backups of your GPO’s directly from the consol (and even restore them) which is less time consuming then a System state restore. Even better are the scripts that follow with the GPMC. With them you can i.e. schedule a regular backup of all GPO’s. I made a script that dumps the GPO’s to a file share, using some the scripts that followed with the installation of the GPMC. Download the GPMC here for Win2003.